The guidelines are grouped into three sections, each of which is organized into sub-sections. At the core are those relating to the assignment task itself and those features of the brief that contribute to the effective communication of this task. The five sub-sections A-E are ordered to reflect the likely order of thought processes a staff member or team might go through when designing an assignment task and then writing the instructions for this task. 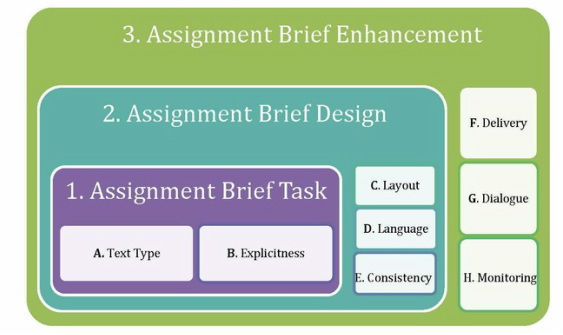 The individual guidelines within each section have been ordered to reflect their likely contribution towards the communicative effectiveness of the assignment brief. These guidelines refer to the core assessment task. These guidelines refer to the final written or spoken product of an assignment. These guidelines refer to the extent to which assessment requirements and expectations are spelled out in the brief. These guidelines refer to the design choices involved in organizing, formatting and expressing the instructions. These guidelines refer to the organizing and formatting of the brief. These guidelines refer to consistency in the use of language in the brief. These guidelines refer to improving communicative effectiveness by means beyond the features of the written brief itself. These guidelines refer to ways of ensuring that the conditions under which the brief is communicated are optimal. These guidelines refer to ways of ensuring that dialogue between and among students and staff about the assignment is as constructive as possible. These guidelines refer to the on-going process of improving the communicative effectiveness of an assignment brief.